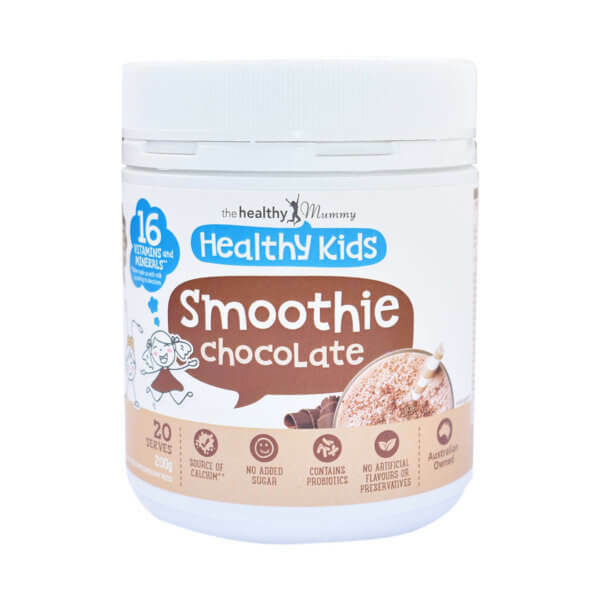 The Healthy Kids CHOCOLATE Smoothie has been specially made as a healthy snack for kids and is ideal if you have fussy eaters or want to ensure your children have a DELICIOUS, nutritious and HEALTHY smoothie snack. As a mum who is also a nutritionist-naturopath, it’s a major concern of mine if my daughter is meeting her dietary needs, as I know how important it is for their health and development. Kids are notoriously fussy, they all go through phases of food refusal and my kid is no different. When this happened to us, I wanted something that would be simple, healthy, and wasn’t a drama when offered. The Kids Smoothie range is a great solution to this! My daughter loves smoothies, and it’s so easy to hide extra fruits and veggies in a product that already tastes great. What is great about the Healthy Kids Vanilla Smoothie is that it contains 16 essential minerals and vitamins, which, when consumed with milk are great for supporting bone health, immunity and energy. One of the other things that I love about these smoothies is that they contain two strains of bacteria that support the immune system and reduce respiratory infections. These are low in sugar they are great for after school or sports training!